The New Leaf Cafe, founded by Bette Midler, is located in the center of Fort Tryon Park. The venue will close on Dec. 29, 2014. HUDSON HEIGHTS — One of Uptown’s most popular restaurants announced that it will abruptly close its doors before the end of the year — raising questions about the fate of several spring weddings planned at the venue. 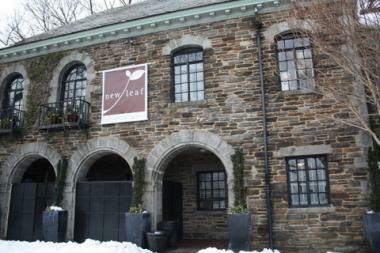 New Leaf Restaurant and Bar, known for its idyllic location inside Fort Tryon Park, will serve its last meal on Dec. 28, according to the Parks Department. The closure, which was decided in the fall but only announced on Tuesday, comes ahead of major repair work at the site. It was not clear how the sudden closure would affect five weddings booked at the venue next year, but a Parks Department spokesman said none had been canceled. The repair work, which involves replacing the roof of the Parks Department-owned building, is expected to begin in January and be completed sometime in the summer of 2015, the agency said. The New York Restoration Project, the nonprofit that has operated the New Leaf since it opened in 2001, will no longer be in charge of the venue once it reopens. Ann Tan-Detchkov, a spokeswoman for NYRP, said the extended closure was too difficult for the nonprofit to absorb financially. The Parks Department said it is currently arranging for a new operator to run the venue. It was unclear if it would reopen as the New Leaf or as a different concession. The restaurant opened in December 2001 and has since become a destination both for locals and out-of-towners visiting The Cloisters, which are is located within the park. The venue also does a thriving wedding business, sometimes hosting two receptions a weekend during its busy season, running from May through September. Parks Department spokesman Sam Biederman said the agency began working with couples prior to the public announcement of the closure to lessen the impact. “While the building will be under construction, it will be possible during parts of the construction process to safely and comfortably host events in the space,” he explained. However, he said final dates and arrangements for the five weddings are still being determined. He could not provide any more details about the weddings. The Parks Department said that repairs to the 79-year-old building that houses the New Leaf are necessary. The stone structure, which was designed by the Olmsted brothers and built in 1935, originally served as a cafeteria and offices for the park's administration, according to New Leaf’s website. It later fell into disrepair after decades of disuse. The New York Restoration Project, a nonprofit founded by Bette Midler, was chosen to operate a restaurant in the space in 2000, its website said. The building underwent extensive renovations before New Leaf opened. Biederman said the restaurant may reopen under a new operator some time in the spring, even before the renovations are completed. He noted that it was NYRP’s decision to terminate its concession agreement with the Parks Department. “Although New York Restoration Project is ending the partnership, we’re thrilled to have worked with them and they remain an important partner for us,” Biederman said.